A UK slot software provider who puts mobile first, Realistic Games mobile slots may not be quite what you’d expect, but they are here to stay. Though quite UK focused in theme and feel, Realistic Games have managed to gain enough notoriety for international slots players to perhaps recognise their games. A fairly young slot software company, compared to the likes of Microgaming and IGT, yet, that hasn’t stopped them trying to play at the big boys tablets. Though the results are too mixed to say that they’ve succeeded, they have managed to create a few mobile slot gems that have made them stand out. Because what Realistic Games slots and casino games are good at are working beautifully on online and mobile casinos at the same time, without sacrificing game play or quality. Sure they are a little simple, and not always hit the mark, but they are usually great fun and reliable. And when you are out and about, isn’t that mostly what you want from an Android slot or iPad/iPhone slot? It Came From the Moon! Realistic Games software has actually been around since way back in 2002. However, it wasn’t until 2011 that their name may have gotten on you radar as their games started to show up on some of the biggest UK sport-betting casinos around. So what happened? Why the sudden notoriety? Because before they helped others create games. Then around 2009 they started creating their own slot machines and in 2011 people started to pay attention. But the best of the best, what they rock at creating, is 3 reel classic slots. The Hot Cross Bunnies game is hilarious and brilliant. Snakes & Ladders is a pub classic and even if you don’t know the original TV show, you can still appreciate the simple fun that is Bullseye. Do you know how few good classic casino games exists on mobile? Well, a few actually, but not half as many as video slots. Obviously casino slot software providers want to display their latest and best as mobile slot games, because that’s what 90% of players want. But it’s nice for those of us who enjoy the simpler spin to know that there is one provider who loves classic slots as much as we do. Enough butter, where’s the sour cream? Depending on which device you use, you’ll see the Realistic slot games differently. Online and on tablet, they are set in a hall full of other slot machines, giving a ‘realistic feel’ to the playing sensation. Depending on the game, it can lead to the it lacking impact online. As an Android tablet or iPad slots it usually works and turns a simple slot, charming. On mobile phone however, they strip all the details back and leave just the reels. Most of the time that’s ok, but sometimes it just highlights some of the worse sides of the slot. Like the lack of graphical oomph. Or the simplicity of the games. How simple are their video slots? Quite simple. 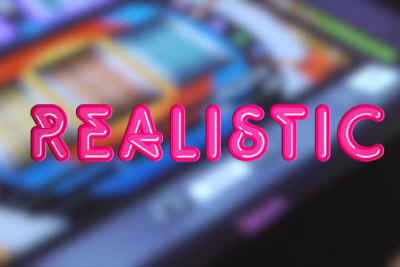 Free spins, wilds, scatters… innovative wouldn’t be quite how we would categorise most Realistic Games slots on mobile. Fun. Reliable. Enjoyable. But not particularly innovative. Then again, you have to allow for the fact that despite their simplicity, their is something wonderfully familiar about them. Even if you’ve never played a single one in your life, you’ll feel like you can just start spinning on any of their slot machines without having to look at the paytable if you don’t want to. The games come easy, but don’t let that fool you into thinking that that means that they don’t make an impact. There’s no need to pretend like you’ll walk away a millionaire from these mobile casinos games. There are no jackpot slots like Mega Fortune or Mega Moolah slot. However, what they usually provide a simple and clear cut ‘10,000x or 20,000x your bet’. And it’s all clearly marked on the instructions of each one. With it’s return to player rate. Transparent, easy to understand and even easier to choose the game that most appeals to your playing style. They are unpretentious, focusing solely on creating the best mobile gaming experience you can get, with new mobile slot games coming out every few months. It’s one of the reasons why, despite some of their simplicity issues, we will still play them and check out every new release. We know there are enough gems in here to find the few that we can play, come rain, come shine, come bad WiFi reception.